Reimagine your products for a connected world. 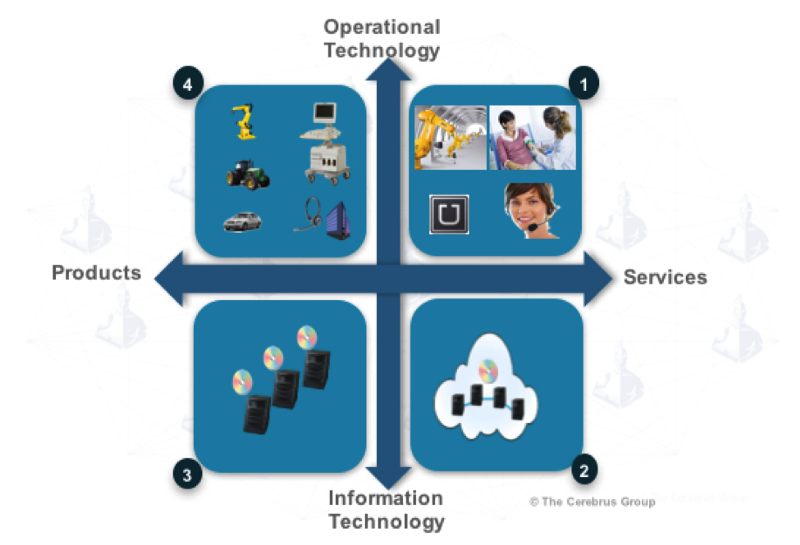 Many years ago, I used the phrase IoT = IT + OT as shorthand for how information and communication technologies (ICT) need to be integrated with operational technologies (OT), and how IT organizations and business operations teams need to work collaboratively in order to realize value from IoT. It was a convenient oversimplification that summarized numerous aspects of our businesses that are impacted by IoT: how we build products, how we take them to market, how our business operations are run, and our M&A strategies for inorganic growth. Part I of this series, this article, focuses on how products need to evolve to maximize the leverage from IoT and to be modernized for the digital age. In the past, product strategies dealt with how we built products by integrating multiple technologies, both IT and industrial technologies. Product design ideas spanned the spectrum of compute-embedded sensors in equipment, communications technologies integrated with equipment for remote management, integration of mechanical and medical devices with electronics, etc. However, a fundamental shift is afoot with IoT in how we conceive and build products for the future. To innovate in a connected world, product strategy must be consumption-centric, not technology-centric. Let me illustrate this shift using a technology-consumption framework below that shows different ways of buying and using products. In the IT world, cloud changed the way we consume technology. Instead of buying technology products from quadrant 3, we buy cloud services from quadrant 2. This prefabrication of IT makes for easier consumption of technology. Elsewhere in the business world, we used to buy phones and computers to run our call centers (quadrant 4). Later we outsourced call centers to BPO firms. We shifted our consumption to quadrant 1 instead of consuming products from quadrant 4. Similar consumption change is occurring in other industries where products like a medical device or a robot can be offered as a service. This change in consumption mirrors the change in consumption preference (and associated delivery model needed) in the IT world. Let’s look at each aspect of consumption in detail. An extreme example of a product that’s undergoing a consumption model transformation is the book. 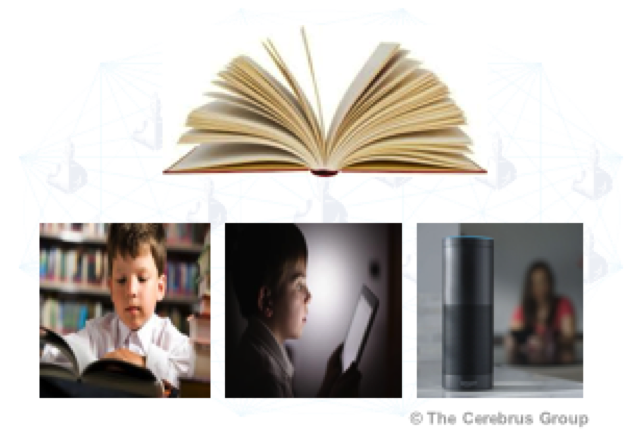 The paper-based book went from a physically shipped item to being delivered via a connected product either visually (on Kindle or smartphone) or via audio (Audible service and Amazon Echo). Advances in ICT allows new ways to deliver your product to your customers and change its form-factor while you’re at it. While your connected industrial product or service may not all go through such an extreme changes in form-factor, it’s imperative to keep these possibilities in mind as you reimagine your products. Product changes are not limited to adding a sensor here, a computer there, and providing an uplink to the cloud. As we can see, connecting your existing product using IoT is a mere stepping stone in a progression. A progression that involves improving your operations, changing your business models, or delivering new offerings that use your existing products as a conduit, as illustrated by Amazon Echo. We have many choices on how to own and operate (manage) what we consume. For ownership, our choices are to own outright or buy rights-to-use. Then we get to decide if we want the asset to be managed by us (Do-It-Yourself) or managed by someone else (Get-It-Done). This leaves us with four options shown below, using industrial equipment as an example. Option 3 is a typical own and operate model. Option 1 is an “as-a-service” model for consuming industrial equipment like IaaS (Infrastructure-as-a-service) or SaaS (software-as-a-service). IoT enables us to more readily offer equipment-as-a-service by incorporating remote management and always-on telemetry. How we pay for the things we consume hasn’t changed over the years. All of our monetization models for products or services can be mapped into these two types below — transactional or subscription based. While the payment types have not changed, combining these payment types with new modes of operations and ownership, and new modes of delivery changes your business model. Internet of Things is partly about value creation, using the ability to communicate and control things over connections and automating how we get work done. Products with embedded intelligence talking to the cloud bring the power of remote control to everyday things, much like the iPhone and iCloud has done. All this requires information technology (IT) to be embedded in our business systems that let us operate our businesses. In other words, it is operational technologies (OT) with IT inside. 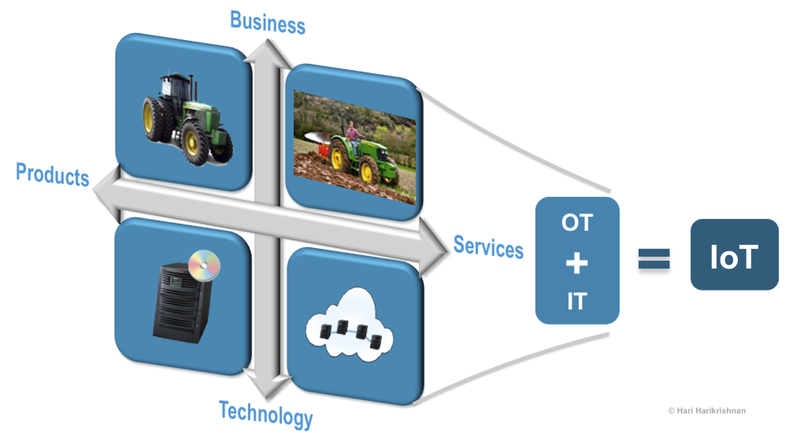 Ergo, IT + OT = IoT in a technological sense. However, when we consider the three attributes of product strategy — mode, operations, and payment for consumption — we aren’t just making our product a simple integration of IT and OT, but we are transforming our business model by becoming consumption-centric. That is the true power of the IoT Equation, IT + OT = IoT. In Part II of this series, we’ll look at how Go-to-Market strategies change in a connected world.